When only the best will do, this stunning Ormolu Luxury Jewelry Casket or Vanity Dresser Box by infamous Apollo Studios is your only choice. This jewelry box graced the vanities of the finest ladies. Apollo Studios was the head to head competitor of Tiffany and Company. 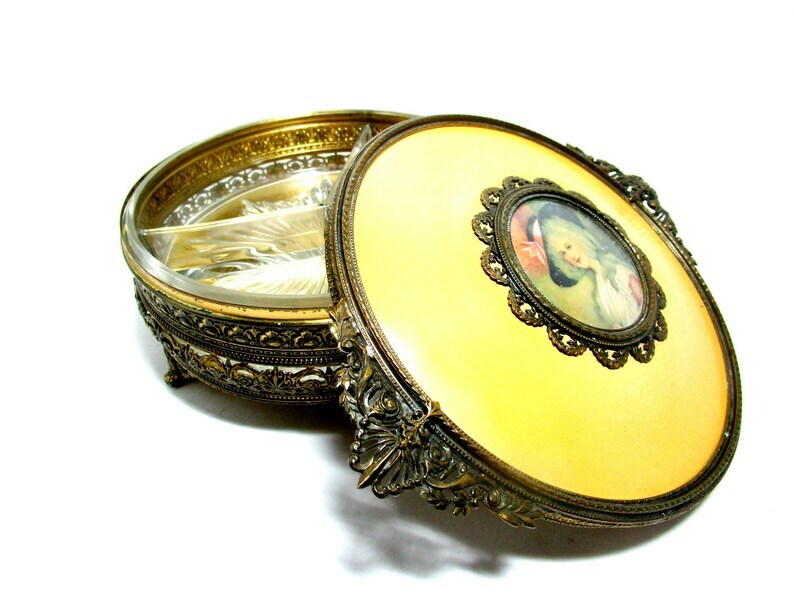 The detailing on this hinged box is immaculate, with a large ormolu encircle portrait in the center of the lid. Heavy and deep relief highlights a scrolling design. The interior contains a removable tri sectioned glass insert. I have carefully looked at this vanity box, there is a small area that has a bit of the gold on the lid scratched, as shown in picture #8. The metal could use a good dusting, or polishing if desired. Is beautiful as is. Marked Apollo on the bottom as shown in picture. Measures 3 1/2 inches high and has a diameter of 7 inches.